Sometimes, a fairly random series of events combine to provide the perfect evening. Firstly, getting in from work I managed to drag myself out for a solo night ride. We've had the first couple of proper winter days - cold, dry and crisp, and I took out the Scandal for the first time in ages. Now, I've mainly been riding the singlespeed 853 Inbred recently, for my off road action. 130mm forks, slightly chunky - it's my "big bike" (though for most it would be a small bike). Anyway, leaping on the Scandal (100mm forks, super light, race geometry) after this was a little, um, frightening. Skittish, snappy, aggressive - perfect for racing, not so good for bimbling around muddy/icy woods, in the dark, by yourself. Still, I survived a couple of hours without falling off and got home chilly but unscathed. 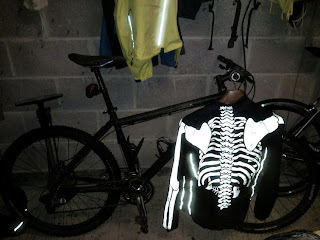 As you can see, I also wore my "Skellington" jacket to keep the creatures of the night away. Next - food. After a quick recovery snack of toasted malf loaf I started on my "Elaine won't eat this so I cook it when she's out" kedgeree. I'd even remembered to buy all the various ingredients I've tried in it in the past - green pepper, mushrooms, lemon, chilli, corriander. It's a recipe that's evolved, and the one tonight was pretty much perfect. Now, a perfect meal needs a perfect drink... 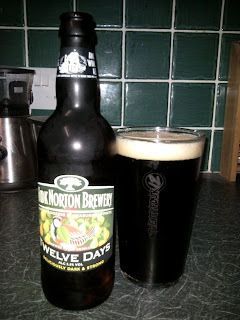 I give you Hook Norton 12 Days... as dark as a night time bike ride. Biking in a winter wonderland!